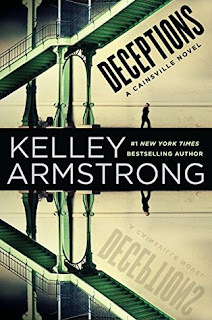 I devoured Deceptions, not just because of the emotional roller coaster that goes on between Olivia and Gabriel, but because there are quite a few important revelations. The most important ones are directly connected to Olivia's parents and to the responsible parties for the murders. I was extremely surprised by a few of the answers revealed in this book. I thought that was well done. Armstrong also ties up other threads and gets rid of a few characters. 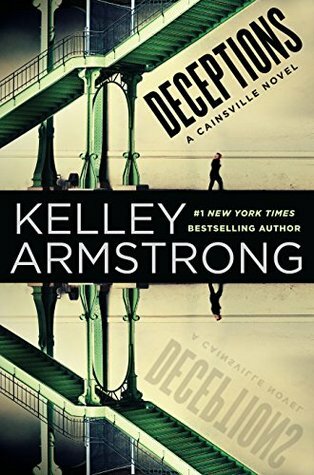 So, Deceptions is a 'must read' for fans of the Cainsville series. The triangle between Olivia, Gabriel and Ricky gathers strength in this installment. Olivia takes her physical pleasure from Ricky and her emotional fulfillment from Gabriel. However, up this point the men have been best of friends and have not interfered with each other's roles in Olivia's life. That changes somewhat in this installment and may change further in the future, but for some reason I believe that no matter what happens these three will remain friends. Personally, Gabriel's tortured and emotionally stunted character is my very favorite, and that is probably because to me he is the one in need of emotional growth. More of his personality and emotions are revealed in this installment which I liked. Olivia, who is great at figuring out clues to mysteries and omens, is clueless when it comes to men and Gabriel in particular. She seems to be a fan of instant self-gratification and her rush to get physically involved with Ricky is a disaster waiting to happen. More so because she has allowed that relationship to deepen when in fact her feelings for Ricky are not what they should be. There is nothing to dislike about Ricky and I don't believe there will be, on the contrary, he is a great guy and deserves better from Olivia, but I can't help but wish he wasn't there. That is impossible, of course, since he has become key to the overall story arc not just part of Olivia's personal life. Don't get me wrong, this installment is not all about relationships, it has plenty of action as Armstrong focuses on a particular mystery and the overall story arc evolves. However, as I mentioned in my review of Visions, the characters and relationships do drive the story. The people of Cainsville, Huntsmen, Olivia's parents the Larsens and other beings make key contributions to this interesting, fast read. I read the book in one sitting. The hints of Welsh folklore that began in previous books are further developed and we learn more of what awaits Gabriel, Olivia, and Ricky. At the end, however, we again go back to Olivia's pesky emotional/physical relationship with her men. The overall story arc depends on three people with problems: Olivia with her lack of judgment, need for love and ingrained fear of betrayal, Gabriel with his stunted emotions, neurotic fear of abandonment, and denial, and charming/ruthless Ricky, a young man with something to prove, just now coming out of the dark. The question here is what is destined to be vs. free will. I wonder. Despite my personal niggles about Olivia's character, this is a fast paced UF installment that moves the overall story arc forward in a big way. 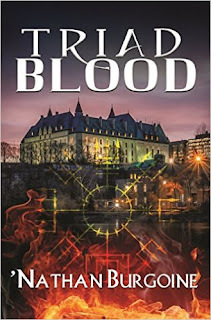 Armstrong maintains that edgy atmosphere I loved in the first two books, and the interaction between characters, main and secondary, continue to keep that sense of mystery alive. For those of you who want to know, in her website Armstrong posted that books 4 and 5 have been sold, and she will wrap up the series by then. Good news! Recommended. While I don't read Kelly Armstrong - I read Bitten and enjoyed it but not really enough to keep going when I have so many other books on board - but I love seeing how much others enjoy her books. She's kind of like a local celebrity here. She lives in a small town about a 20 minute drive from the city I live and she does a number of appearances 'around town' I don't know if you get it where you live, but there is also a series now based on the book Bitten. I'm ashamed to say that I don't watch it. I'm not really supporting her much am I? So *chuckle* I'm glad you are. I just finished this the other day. I think it worked better for you than it did for me, probably because my pet hate is love triangles, and the Olivia/Gabriel/Ricky relationship was front and centre in this book. The second Cainsville book is my favourite to date. Kristie - I'm really jealous that she's "local" to you! I love her Otherworld books (BITTEN is the first of that series). LOL Li, I also hate triangles with a passion! I believe that this series is working for me because the triangle was not there from the beginning. And, that triangle is key to the overall UF story arc and not just to Olivia's private life. Otherwise, it would drive me nuts. As it is, Olivia got on my nerves in this installment (that has been building steadily since the last book), and I don't know how the next installment will work out for me as far as the triangle goes. However, as far as the revelations and rest of the story, Armstrong really worked it well and I'm enjoying the series as a whole. So far, I loved both the first and second books. In the first one I loved the atmosphere and set up, the second one had that great UF feel.